The patent leather material is the statement version of leather. It’s glossy, it’s edgy and it’s a perfect material for elevating your outfit. Perhaps the most common way of working the patent leather, which is a pretty neutral way too, is to use it as pants/leggings. Skirts are also pretty common as well as shoes and bags. Patent leather is often done in black and the way to style it is to treat it like any other black leather piece. Pair it with a basic white t-shirt, some knitted materials or why not faux fur. The glossy look of the material can favorably be enhanced to create a fun effect – sequins, metallic fabrics and ones with glitter can be really chic to do this with. Perfect for the holidays too! The faux furs are really popular atm, being done in every other style and as every other jacket. This season the (faux) leo print fur is really popular, but (faux) teddy fur and (faux) fox have also been popular. What to think about when styling the faux furs is that they tend to be quite voluminous, either the faux fur itself or the style of the jacket. It can be a good idea to balance this with tight pants/jeans/leggings to get a good contrast in the outfit. One alternative is also to use high heels or to match your pants and shoes in the same color to create an elongating effect. Faux furs often have a more elegant and luxurious vibe to them, which makes them fun to match with edgier materials such as denim or flannel! Corduroy is that typical fall material as it’s cozy, warm and goes well with the fall colors. It’s also heavily associated with the 90s fashion, which can make it a bit tricky to match. I think the best way to deal with this fabric is to add modern elements to the look. That might be statement sleeves, some modern sneakers, a leather jacket or a transparent material if you want to break off the look completely. Corduroy is popular to do as jacket, overall, skirt and pants which is why it’s a good opportunity to add those trendy details. Don’t forget to add the fall colors to enhance the seasonal vibe! Read more about corduroy here. Velvet is one of those fabrics that always are more or less relevant each fall. Velvet had a major upswing two years ago, but is of course relevant today as well. The fabric is rich, both in its texture and color which gives that luxurious and elegant vibe. Velvet is perhaps most common in red, green, navy blue and black which makes it a great option for the holidays, both Christmas and New Year’s Eve. I like to mix up velvet with patent leather, denim or something silk to balance the heavy and elegant look. A blazer in velvet is a timeless investment, but also an LBD or a red holiday dress! 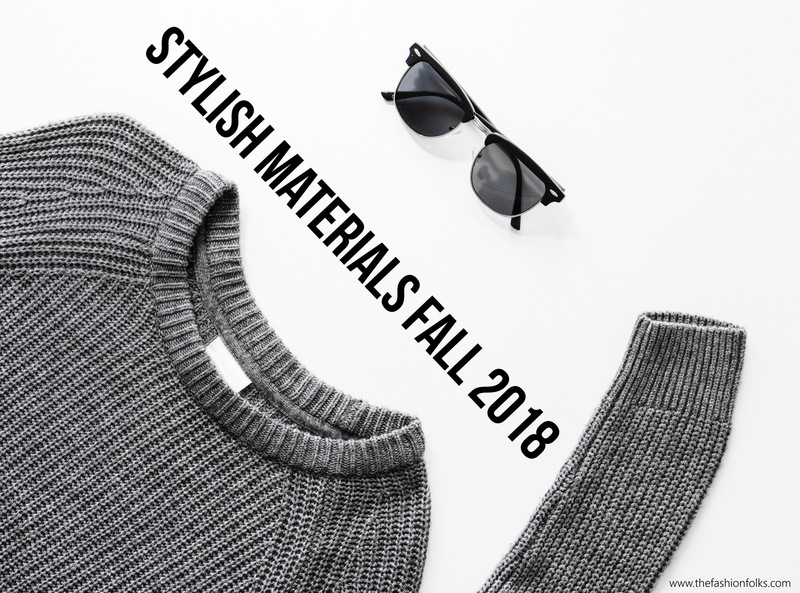 Lastly, this can’t possibly be a post about materials fall 2018 without mentioning knitwear! This timeless, beloved, style of material can be done in so many ways and have been done in so many different ways. The statement sweaters are probably the most popular ones at the moment. Knitwear is perhaps easiest to style when done in grey, black or white but a splash of color is of course important for the fall fashion mood. If you already own some basic sweaters, dare to invest in a colorful one or one in a fun style next time. Go for a color you love to wear to make sure you’ll use the sweater. One with statement sleeves is quite trendy atm and is a trend that’s here to stay for awhile = safe to purchase those too! Don’t forget the oversized knitted blanket scarves if you want to keep it real cozy! Ahh I love all the fun textures this time of year! Velvet, corduroy, knits… I love it all! I think I need a new sweater with some fun sleeves. These are some of my absolute favorite materials this fall, especially faux fur. I can’t get enough this season! Velvet will forever be my fave! So cozy and chic! I’m in love with faux fur and velvet. They’re perfect for winter! Velvet is my go to for fall. Velvet is my favorite this time of year, I just can’t get enough! !